When God wants to stretch me, He doesn’t consult me because if things were left up to me, my life would always be comfortable. After completing my second year of inner-city teaching, urban education seemed way too challenging, so I applied to teach at a private Christian school because I thought it would be my dream job and let’s be honest more “comfortable”. The truth is, I have spent most of my life seeking comfort while avoiding my long list of fears: you know, fear of embarrassment, fear of failure, and fear of not being liked just to name a few. During my 3rd year in the classroom every one of my worst teaching fears came true. My anxiety was so consuming that I wanted to give up nearly every day, but I couldn’t run this time. I was forced to face my fears. Thankfully, the Lord met me in that dark place, and I have never been the same. 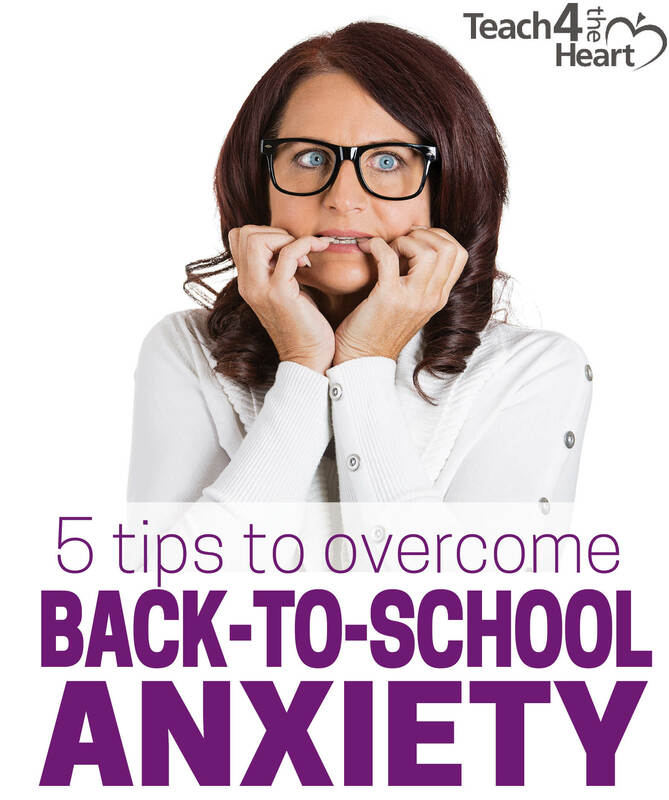 As the school year begins, you may be battling feelings of inadequacy, fear and even dread, but I hope that my story and the lessons I learned will encourage you to push past fear and trust God like never before! Within the first 3 weeks of school, the principal’s son started a petition to get me fired and a third of the 8th grade class signed it before the boy felt bad and stopped. I found out months later, but the damage was already done. Another teacher’s son spread a vicious lie to the parents accusing me of looking at inappropriate materials on the internet and cursing in class. The parents believed it and never checked with me. I found out by accident and was completely broken hearted. Before Christmas break, I found out that my students created awful memes making fun of me and spread them throughout the school via social media. I was crushed to know that I was a joke to my students. Hoping to build relationships, I shared my testimony with a few of my classes only to have some of the students invent graphic details that I never said and once again enrage the parents based on lies. I felt helpless in my attempts to build relationships. The students were incredibly intimidating and challenged me publically day in and day out! It seemed that their favorite game was “test the teacher!” Every “trick” I had learned up to this point just didn’t seem to work on these kids. Each day felt like I was auditioning for my right to be a teacher at their school, and the “judges” were not nice. I had students that were actually looking for me to make mistakes, so that they could tell their parents. When I didn’t mess up they would make things up. Many parents treated me cruelly—when they bothered to talk to me at all—and I cried myself to sleep most nights only to face more tears in the morning. Sadly, I could go on and on about how I was lied about, made fun of, verbally attacked and intimidated by parents and students for a whole year while the administration did nothing but blame me. The good news is God does not waste pain! The Lord taught me some powerful lessons during that difficult year. Sometimes as a teacher your worst fears do come true, but with God’s grace you will make it through stronger, wiser and more skilled! 1. Don’t be intimidated by anyone because God is your defender and your protector! Normally we fear people because of what we think they can do to us. The fears can range from the fear of being mocked to the fear of being fired. 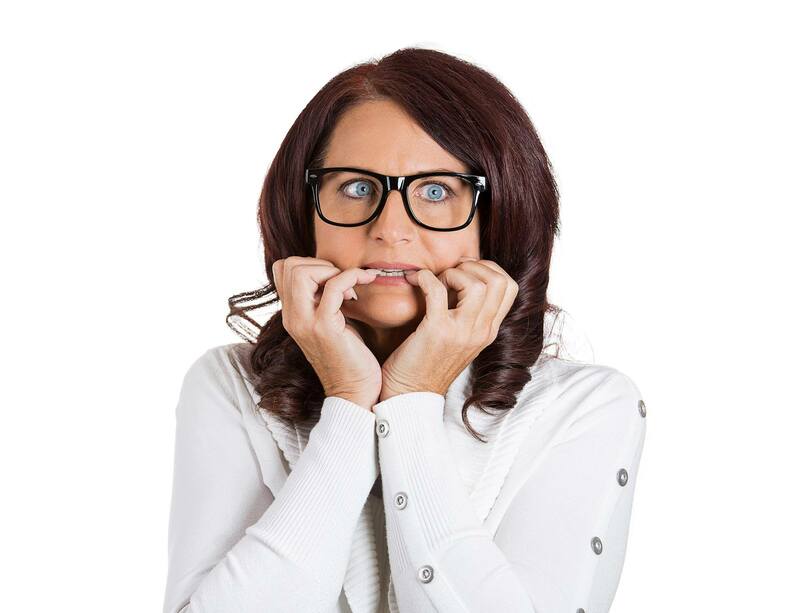 During my Nightmare Year of Fear, it seemed like intimidation was lurking around every corner. Some parents would send scathing two page emails at the drop of a hat. Other parents would skip right over speaking with me and go straight to the principal or even higher before I had a hint that anyone was upset. A few parents ripped me to shreds face to face. Since students were constantly lying about me for fun, I was never sure which parents were mad at me, and I didn’t know if the stories they were told were even true. I really had to battle fear of the future because I feared that lying kids, gossiping parents and an administration that catered to the whims of powerful families were ruining my dreams. As crazy as it sounds, in spite of everything, I really wanted to stay and be successful at that school. I cared about the kids and wanted to make a difference. Yet I had to surrender my desires to the Lord. God was so faithful to shine light on the schemes of my enemies and vindicate me in so many ways, and He will do the same for you as you trust Him! I encourage you to surrender all your dreams to God afresh, and don’t fear what any person (or group of people) can do to you—especially when you know you are doing your best before God and man. 2. Perfect love casts out fear, so don’t be afraid to speak the truth in love! Because of the fears I have battled, confrontation has always been difficult for me. In addition to fearing the parents and administrators, I found myself very intimidated by the students. I felt like a baby bunny in a room full of hungry vultures. Due to the dynamics of the school, the power balance fell in favor of the students which left teachers on the bottom. Sadly, the students were very aware of the impact their parents had on the school, so they felt empowered to intimidate teachers. My attempts to discipline students was a joke to them. When I tried to give consequences, the parental responses were so outrageous that I became afraid to hold students to high standards knowing that I was unsupported. When parents spoke to me in hurtful and unacceptable ways, I felt powerless to speak up. I knew I needed God’s strength to help me overcome my fear of speaking the truth because it was eating me alive and allowing grievous sin to go un-confronted! I learned that in order to overcome fear, I had to ask God to help me love the parents, students and administrators. Although it was way outside my comfort zone, I chose to hold students to high expectations, and tell their parents the truth about their children’s behavior whether they chose to listen or seek revenge. I had many conversations with the administrators about what I was experiencing with the parents and students and how it was affecting me. I also lovingly spoke with my superiors about the ways I felt unsupported and blamed. That year God have me courage to speak to many intimidating parents (who happened to be board members) about their children—even though they were NOT happy with me for it. God gave me the boldness to speak with the Head of the School after literally dozens of attempts to get help from my Principal and the Dean. Even though it was hard, I reminded myself that telling the truth and confronting sin is the most loving thing to do—especially when you are in a school that is representing Jesus Christ! In tough situations, seek guidance from the Lord! There is definitely a time to speak and a time to hold your peace, and as you seek God He will give you wise discretion regarding what to do in sticky situations. However, never let fear be your motivation for staying silent—especially when you need to discipline a student or speak with a parent! Remember speaking the truth kindly and gently is an act of love. 3. Walk in humility; seek continual growth, and make excellence your goal. As a teacher our mistakes are often public. This reality lends itself to teachers getting lots of criticism — sometimes constructive and sometimes... not so much. During that tough year, God actually exposed a lot of areas of pride in me and it hurt! Due to my fear of embarrassment and the mean spirited culture of my school, my goal for each day was to make it through without any major instances of humiliation. To make matters more stressful, I was still relatively new to teaching, and I had jumped up 4 grade levels (going from 4th grade to 8th grade). I went from having 19 students the previous year to 103! I struggled to learn the unfamiliar content, teach it and be organized. I was also transitioning from an urban public school to a ritzy private school, and it seemed like every instructional strategy and classroom management tool I had been taught was opposite of what the students were used to. As you can imagine, I had people lining up to tell me that everything I was doing was wrong, wrong, wrong! The torrent of criticism felt unceasing, and some of the messengers were filled with such spite and anger that I simply shut down. I became defensive because I felt attacked, and I could not separate good suggestions from attempts to hurt me because it was all coming at once. Eventually I was able to pull myself together and sort through what people were saying. I had A LOT of room for growth, and I truly needed to improve. Some of the criticism I faced was warranted even though it was done in the wrong spirit. I set out to learn my content better, be more prepared and read awesome books on teaching. I still struggle when receiving criticism, but I have found that the place of humility is the safest. When you humble yourself, God promises to be the one to exalt you! The plan I recommend is prayer first! Ask God for strength, and ask Him to lead you to the right people, places and materials to help you grow as a teacher! Then I would recommend spending 20-30 minutes per day learning (or brushing up on) your content so that you feel confident to teach it. I’d also recommend reading or listening to something motivational for teachers daily. There are so many great blogs and podcasts (like the one your reading) to encourage you when you feel beat up or afraid as a teacher. 4. Give yourself grace, and don’t see failure as final! 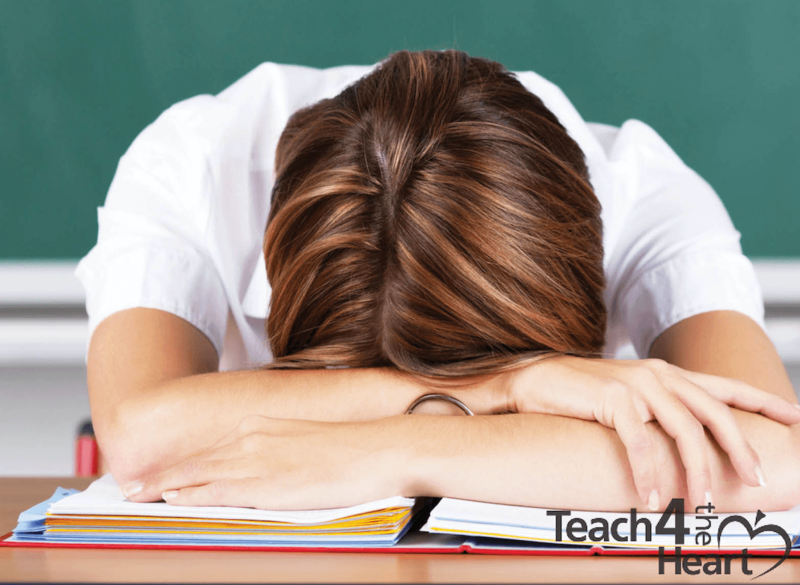 Most would agree that teaching is one of the hardest professions on the planet. Anything difficult takes time to master. Movies often give the impression that brand-new educators routinely walk into their first year of teaching with legendary skills that transform the toughest students instantly! The truth is that champion teachers have mastered a complex set of skills that often took them years to develop. Don’t get discouraged (especially as a newer teacher) if you feel like you still have so much to learn and achieve. Admittedly, administrators, parents and your students will probably have super high expectations for you (which is understandable), but you must give yourself grace when you make mistakes (because many people don’t think to give teachers grace). Give yourself permission to learn and grow, and don’t think that failure is the final verdict on your teaching ability. See failure as evidence that you are learning and remember that mistakes are normal. Challenge yourself to learn from your missteps. I recommend keeping an informal journal where you write down mistakes that you don’t want to repeat along with the goals you want to implement next year. 5. Place your identity in Christ and refuse to let anyone or anything define you but God! I have battled with insecurity since childhood, and I found that the teaching field can be brutal on my identity if I’m not careful. You may feel the temptation to see yourself through the eyes of parents, administrators and even students. There is pressure to make sure everyone thinks well of you. You may even want to be popular or everyone’s “favorite” teacher. I know I did! When lots of people are affirming and encouraging you, it feels great, but the danger comes when you feel shame and accusation coming at you from all directions. Whether it is due to low test scores, a less than stellar evaluation, catty coworkers or critical parents and students, it is easy to internalize disapproval and wear condemnation and failure like a cloak. This is why we should see ourselves, first, as a son or daughter of God! We will experience healing of our identity as we choose to dwell on God’s love for us! We are declared righteous in God’s eyes because of Christ’s perfect report card given to us, not because of our own perfect works. One of the most helpful things you can do to remind yourself of these truths is to find a list of Scripture about who you are in Christ. Then, read them aloud every day or meditate on them during your quiet time. And to make things easier, we're happy to provide just such a list for you. 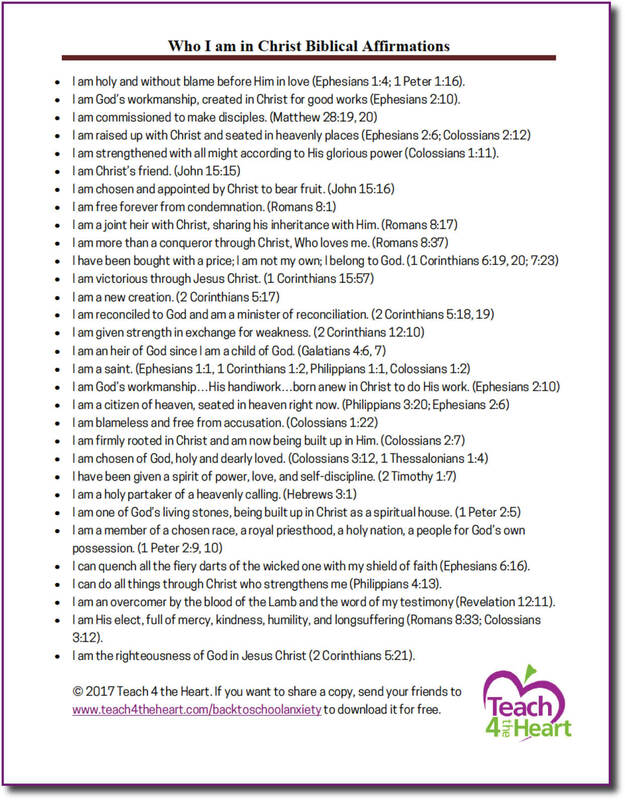 Request your Who I Am in Christ Biblical Affirmations list. 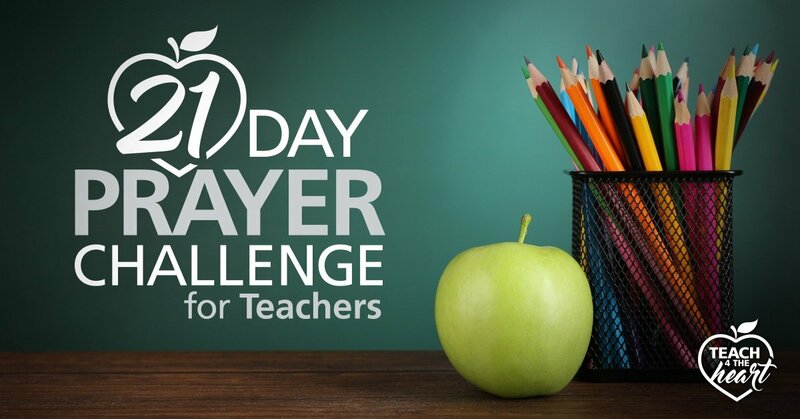 Join thousands of Christian teachers in committing to pray for the new school year. We can't wait to see what God will do not only in our classrooms but in our own hearts as well. 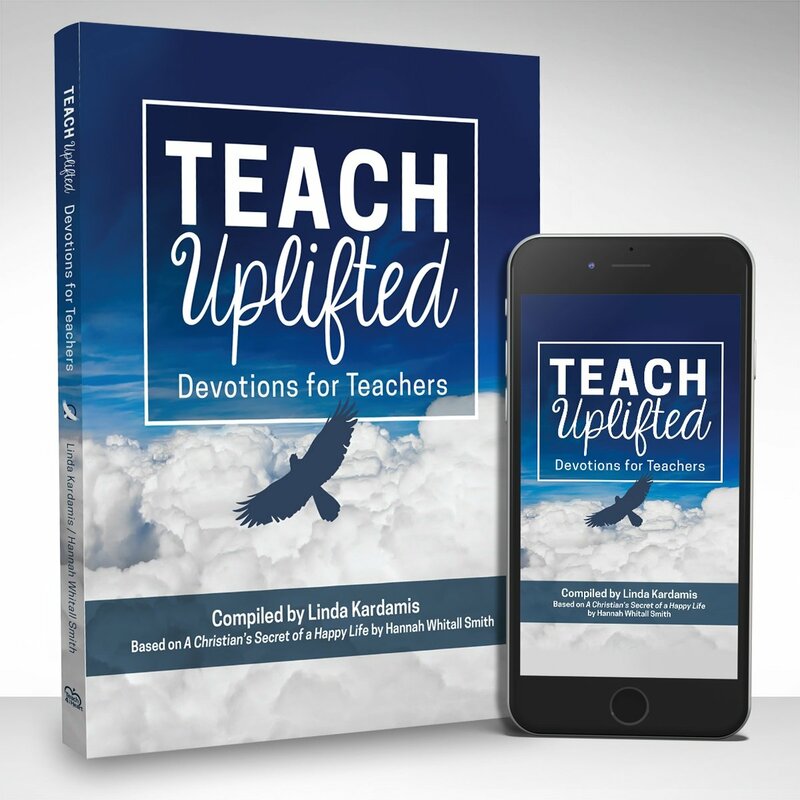 In Teach Uplifted Devotions for Teachers, we explore in depth what it actually looks like to trust Christ and surrender to His plan for your life. Find out more about this life-changing book here. I Truly enjoyed this reading looking forward to the Daily Motivations! This blog was truly inspiring to me. It was like reading my own story. Thank you for this ministry. I will definitely use this encouragement each day.